This Monday will be the tenth anniversary of one of the most improbable and unusual adventures experienced by my parents, and I am the one to blame. By the time it was all over, our quirky story had been covered twice by the local newspaper. Mom and Dad became small-town celebrities for a brief time, recounting the incident for everyone from fellow church parishioners to Dad’s doctor. They came across favorably as loving parents who gamely went along with a bit of outrageousness solely to indulge their youngest son. I was 32 at the time; they were 67. The story began more than 20 years earlier, though none of us could have known that at the time. Who would have thought that a few nonchalantly expressed words from my father would have such a long-range impact? Who could have foreseen how the longevity and vicissitudes of an aging rock star’s career would one day illuminate those forgotten words with the intensity of an enticing marquee? But that is what happened, and Dad saw to it that he was a man of his word, even if it meant fulfilling a casual promise decades later. Around the time that I was seven years old, I became aware of shock rocker Alice Cooper. Everything about him resonated with my formative artistic sensibility: engaging music, over-the-top theatrics, and a macabre, dry sense of humor. I found Alice to be thoroughly entertaining, and so I had no qualms about parting with five bucks for the first new record album I ever bought, Alice Cooper Goes To Hell. My parents were not so enthusiastic about my increasingly engrossing interest, but they were nevertheless quite tolerant, allowing me to amass my favorite artist’s back catalogue by picking up bargains at used record stores. Nor did they mind that I would buy any magazine that had even minimal content pertaining to my hero. It was all harmless enough, they believed, and they grew to accept my fascination with all things Alice as just another eccentric dimension of my personality. However, they drew the line at attending concerts. This was rarely an issue, because my hometown of Lima, Ohio did not often host headlining rock acts, and the pre-Internet age made it a challenge for any small-town kid to know when a favorite artist’s tour itinerary might swing within a hundred miles. But in the summer of 1980, I was ecstatic to learn that Alice would be playing Detroit on the very same night that my brothers were planning on attending a Tigers game. I begged my parents with the tenacity of an obsessed 12-year-old, but they wouldn’t budge. Neither would I cease my campaign. It was a brilliantly diplomatic bit of parenting. Like an insurer calculating the risk of a new policy, Dad knew that the odds were highly in his favor. The promise assuaged my angst without really promising anything. After all, how likely was it that Alice Cooper would ever perform in Lima? Ah, but showbiz is a volatile world, and when it comes to promises, a boy will maintain an elephant’s memory well into adulthood. Twenty years passed. Alice had seen his career dip and rise like a rock and roll rollercoaster. Coming into the new millennium, he had a new album to plug and wasn’t above promoting it at smaller venues. I had just abandoned my job of ten years and was well into the graduate studies that would allow me to make a career out of teaching. I had also bought that new Alice album. And then I saw the itinerary for the Alice Cooper Brutal Planet tour. One of the dates stunned me into a state of open-mouthed shock. I was being a little cheeky, poking fun at Dad for making a promise that he was certain he would never have to keep, yet I truly did want to see the show. In fact, with or without Dad, it was my intention to go. I don’t know how he reacted when he read my message, whether he tittered with amusement or recoiled in horror, but by the time we spoke with each other, he made it clear that he fully intended to deliver what he had promised. Our family was abuzz. Dad, whose musical preference was primarily classical (and certainly not encompassing classic rock), was actually going to subject himself to an Alice Cooper concert. Mom was worried. Afraid that he might be overwhelmed by the experience, she decided that she would accompany us. Now I was a bit worried, and my concern would turn out to be prescient. The fairgrounds was not an ideal venue for a general admission concert. There was an unusual upward slope to the ground in the first few yards nearest the stage, which was set up opposite the grandstand. It seemed to influence the crowd to bunch even tighter together than they might have otherwise. We were right in the thick of it, having inserted our earplugs before edging our way up front during the tepidly received opening act. As I looked around us in the lull between acts, I was struck by the nature of the crowd. Never before (nor since, in fact) had I sensed such a grim hostility from an audience. Perhaps the security had something to do with it. Rather than employing the typical beefy college guys in bright yellow “STAFF” t-shirts, the promoters had hired grizzled, leather-clad, tattooed, bandanna-wearing bikers who looked like they wouldn’t be bothered by a little violence. I grinned at Mom and Dad, who appeared to be taking it all in the proper spirit of amusement. The band tore into the title track of the new album, and there appeared Alice, looking like the demented overlord of a fallen civilization. The show was terrific, a visually stunning showcase for the Brutal Planet concept, and I was enjoying it immensely. So, apparently, was much of the rest of the crowd that was mashed together near the stage. A strong marijuana odor permeated the air, and some of the revelers were getting a little rambunctious in their partying. I positioned myself so as to protect Mom from getting pushed. The show ambled along, me having a good time, Mom and Dad tolerating everything good-naturedly. Still, the audience near the stage was a bit unsettling. A few of them seemed to have imbibed or ingested enough illicit substances to make them utterly unconscious of their surroundings and totally insensitive to the people crushed around them. One young man in particular was whipping himself to and fro and upon everyone in his immediate vicinity, which unfortunately included me. I stood still as a rock as he bumped into me repeatedly, determined as I was to shield Mom from being jostled. Eight songs into the set came Wicked Young Man, a new number that revealed the twisted psyche of the sort of person who would plot a Columbine tragedy. It was dark and thought-provoking, like much of the new album, but the neanderthal next to me wasn’t getting it. In fact, he seemed to be the embodiment of a wicked young man, and when he crashed into me with enough force that I couldn’t stop careening into Mom, I had had enough. The next time he pushed, I pushed back, and that is when the sociopath lost his temper. From the crazed look in his eyes I knew instantly that this was a battle not worth fighting. He screamed at me as I backed off with my palms held up in a show of submission. I looked about and saw that the security toughs were not interested in my plight. God knows what somebody would have had to do to get ejected from the show. It was a time to cut my losses, and so I considered it a moral victory that I escaped being eaten. Mom and Dad decided to retreat to the grandstand for the remainder of the show, and I went with them, having no desire to hang out with the thugs who were taking over the front of the stage. That nasty business cast something of a pall over the rest of the evening, as Alice’s act seemed insignificant in the face of blatant aggression. Oddly enough, the incident only underscored the pessimistic social commentary of Brutal Planet. I’m sure my psychotic friend did not catch the irony. Yes, Mom and Dad were true to their word. 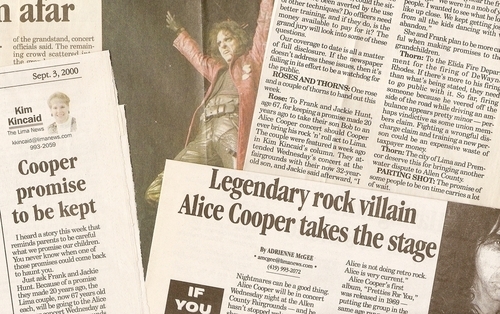 As of this writing, the Alice Cooper show at the Allen County Fairgrounds was indeed their first and last rock concert. And as for me, I’m all out of promises left unfulfilled. 2 comments on "Alice in Limaland"
A couple of months ago I asked when you were going to write this story. Like your parents, you keep promises, too.